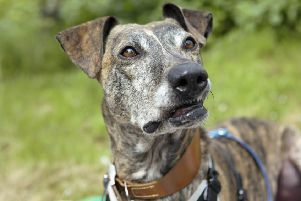 Benny is a charismatic lurcher that never fails to put a smile on the faces of staff and volunteers at Dogs Trust Shoreham. When the seven-year-old is not lying upside down, sprawled out on a sofa, the playful pooch be found chasing around squeaky or fluffy toys. Tracey Rae, rehoming centre manager, said: “Full of love and life, Benny is always enthusiastic to greet people and adores receiving attention from his human pals. “The energetic lad would love active owners who have the time to take him out and about exploring. He travels well in a car and would enjoy driving to quiet, rural areas for an adventure. Benny is looking to be the only pet in a home with teenagers aged 16 years and over. Call the Brighton Road rehoming centre on 01273 452576.